I've had a bit of a change in attitude this week. I've been thinking a lot, about both bad and good things, whilst trying to get myself in order and having a bit more of a plan in life. As always with my weeks recently, there have been really horrible bits and really lovely bits. It's a good thing the nice bits equal out the not so nice. Anyway, here are some of the things that have made me happy this week. 1. My days off - Oh how I needed these. I was so exhausted, I feel as though I wasted them by sleeping, but at the same time I can't think of a better way to have spent them. 2. Hot cross bun loaf - One of my favourite things about the run up to Easter is that supermarkets go hot cross bun crazy. I've eaten so much hot cross bun loaf this week I'm probably helping Tesco sort out their financial issues single handedly. 3. Pancake day - One of the best days of the year if you ask me. I managed to fit in 4 normal pancakes and a few scotch pancakes, including one at work. Not the normal pancake day where I eat them non-stop for every meal, but still a decent effort. 4. Winter weather - I feel I jinxed this slightly as I wrote this yesterday in a draft, then all day today it has been truly disgusting weather. I was sat in work at 7am the other morning watching the sun rise through the window thinking how pretty it was. Then we've had a few really nice blue skied yet chilly days which are one of my favourites. I want that weather back please. 5. Skyping with the girls - I was lucky enough to finish at 6pm tonight, so finally had the chance to talk to Eppie and Jane, making some very exciting plans whilst we were at it. Also, extra points for Eppie this week as she sent me a card in the post and it literally made my day. As I mentioned in one of my five happy things posts, I've been feeling a bit depressed lately about how much work is taking over my life. I know it's just me having to get used to working full time, but with my shift patterns being so different to my friends, I'm a bit worried about when I'm ever going to have a social life. I know I'm being silly and I'll definitely find the time to see friends at some point. This led me to think about what to do on my days off. I live in a really lovely part of the country, with a whole load of new places to explore and see. 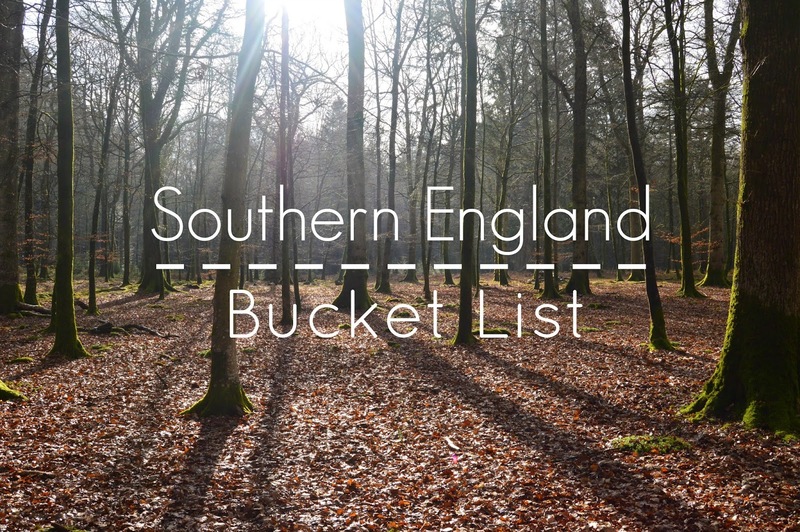 So I decided to write a 'Southern England Bucket List' of things I can do on my days off and when friends come to stay. I'm going to keep adding to this list when I see anything I want to visit. Do you know anywhere I should add to my list? 1. Wagamamas - I had the rare occasion where I finished work at the same time as normal people on Wednesday. So I took the opportunity to meet up with Georgie for a Wagamamas. I'd never been before and the fact they serve Mochi was a huge winner for me. 2. Cows - Most of my friends know that one of my dreams is to own a few brown cows, so I can make my own ice cream. There's just something about brown cows I find adorable, odd I know. So I was very excited when I drove through a huge herd of them when I was driving through the forest the other day. 3. Cheese jokes - Eppie sent me these cheese related jokes the other day. Even though I'd heard most of them before I had a good giggle at them, which definitely cheered me up after a tiring shift. 4. The Cadbury advert is back!! - Oh the excitement. If I had to tell you a few of the things which made me happiest last year, the original advert is one of the few things that spring to mind. I just can't watch it without feeling happy. So when I saw this on my TV the other day, I was way too excited. 5. Food Programes in general - Great British Comic Relief Bake Off started this week, not quite the baking inspiration as the normal show, but still a good watch. I've also been catching up on James Martin's Home Comforts series on iPlayer, which I'm really enjoying. Basically if it's food related and on iPlayer, I've watched it. Happy I'm Still Single Day! Today I'm going to be spending my day surrounded by couples getting married and then more couples enjoying an evening eating amazing food together. In Valentines Day tradition, I'm going to give you a list of things you can do if unlike me, you're single and able to avoid the world asking why you don't have plans and telling you Mr Right is just around the corner. 1. Watching the Magic Mike XXL trailer, because you can't watch this too many times. 2. Playing Tinder Bingo - Buzzfeed have created a Tinder Bingo game. Plus it'll probably make you glad you're single after seeing some of the guys on there. 3. Thinking about how much money I'm saving over the year. Then going and spending a bit of it on something I've had my eye on. 4. Baking - I particularly like this "Pies before Guys" idea. 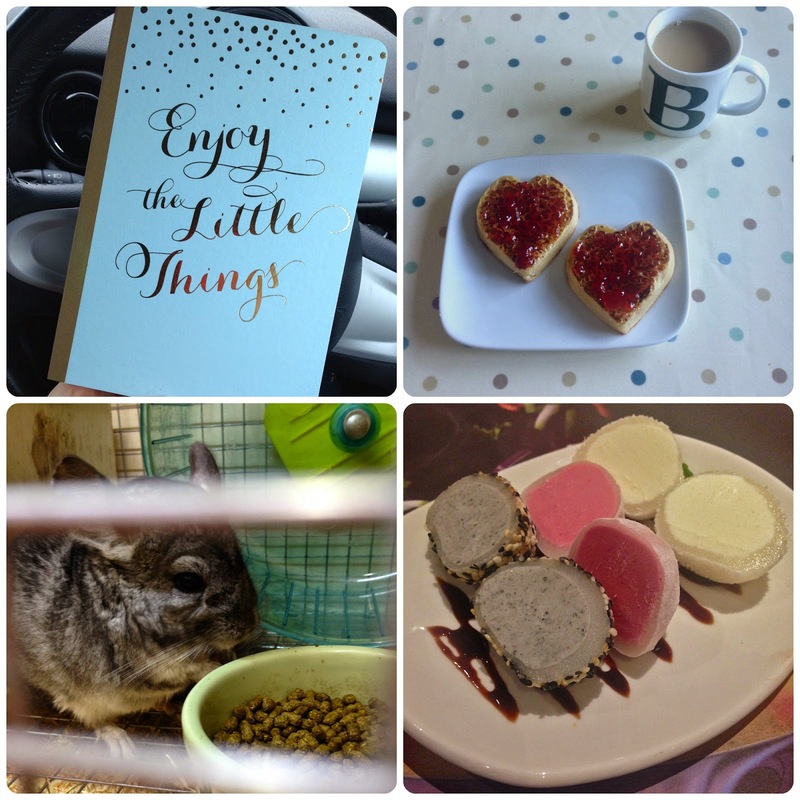 Have a look at her Instagram whilst you're at it, so many good ideas! Alternatively, you can make yourself a courting cake and attempt to find yourself a man. 5. Watching The Notebook with a big bag of toffee popcorn, basking in the fact that I can spend the night in, PJ clad and make up less. Oh the joys of being single. How're you spending your Valentine's Day? I'm going to make this one short and sweet, as it's currently 11pm and I'm struggling to keep my eyes open. Instead, I shall leave you to feast your eyes on the Magic Mike XXL trailer, which is among the things which made me happy this week. 1. Superbowl half time show - I've watched the Superbowl every year now, since Bruce Springsteen performed the half time show in 2009. I have absolutely no idea what's going on from a football perspective, but from an events point of view I love watching the half time show. Not to mention the famous shark. 2. Snow - I woke up to an Instagram feed full of snowy London photos earlier this week. Turns out, we were lucky enough to have a dusting of snow too. 3. Walk in the forest - I blogged earlier this week about my walk in the New Forest. Definitely a highlight of my week. 4. Sewing Bee - It's back on BBC this week! Not only do I get to learn more about sewing skills to aid me in my quest to be the ultimate housewife, I get to have Patrick Grant on my TV screen for an hour. 5. Magic Mike XXL - Saving the best till last. I finished work to a message from Eppie who had sent me the trailer for this. Prepare yourselves ladies. I first came across the idea of courting cake whilst watching The Great British Bake Off. Courting Cake is an old Lancashire tradition, where ladies would present a cake to the man they were currently 'courting' in an attempt to win them over and get a proposal. Sounds like a good plan to me. As it's nearly Valentines Day, I thought why not whip up a courting cake in an attempt to find myself a man, like a Kelis of the baking world. Aside from the cream looking very overwhipped in the photos, it turned out pretty well, so surely it's just a matter of time before the men come flocking. 2. Cream the butter and sugar together until pale and fluffy. Add the beaten eggs a little at a time, beating well. 3. Fold in the flour. Add enough milk until it has a dropping consistency. 4. Divide between the three cake tins and bake at 180C for 25-30mins until risen. Put onto a wire rack to cool. 5. Whip the cream until it holds its shape. Put cream in between the layers and decorate each with strawberries. Dust some icing sugar on the top and add a few more strawberries for added decoration. 6. Sit back, relax and wait for the marriage proposals. Today I woke up to an Instagram feed full of excited Londoners waking up to snow. I hopefully peeped out the window, not expecting anything, yet a very slight dusting of snow met my eyes. Like an excited five year old, I jumped out of bed, rustled up some porridge, got dressed and headed to the forest. Unfortunately, by the time I got there the light dusting of snow had melted away in most places, but regardless, there's never a bad time for a walk in the woods. There's something about the forest that makes everything in my head seem to fall back into place and make everything clear again. I got back into the car feeling inspired, happier and full of excitement for future plans. This week I wanted to share a video with you, specifically the TED talk by Aimee Mullins. I watched it on Netflix this week and really loved the message she was giving. To sum up the video, she's saying that with the right attitude, you can achieve anything you want to achieve, it's only doubt in ourselves that stops us. She says that if we can just make one person believe that they can do it, it may just be that one thing they need to hear to give them the boost and the confidence to go out and do it. It's a really great TED talk, so I'd suggest you go make yourself a cup of tea, get comfy and spare 20 minutes of your day to watch it. 1. Emma Watson being cast as Belle - Emma Watson and Disney combined into one film. To say I was happy with this announcement is an understatement. 2. Heart Radio - The music they've been playing this past week has really cheered me up on the way to work. Can't beat the classics. 3. Snow - It snowed for about 10 minutes this week. It resulted in me running around work like an excited child, whilst everyone else complained about it. Spoil sports. 4. Time to relax - Mainly involving reading my tattered Paddington book and watching Tangled. Evidently trying to counteract all the grown up things I've been subjected to this week. 5. Customers at work - Everyone in work agreed we had one of the nicest couples come in this week. I had a chat with them about how they were Disney Vacation Club members and loved spending time in Florida, with their Grandchildren going out each year too. My conversation with them and how sweet they were really made my day.